After the original Buzzfeed-Post: the NICE-Team has made it’s own version of what to see, do, and most importantly eat in Argentina. Check out this country’s highlights of places, cultural sights and food below. 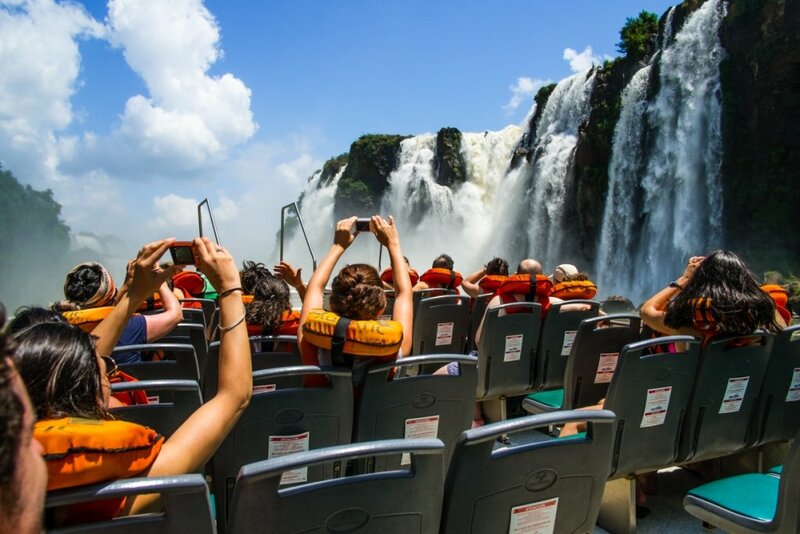 It borders with Brazil and contains about 275 waterfalls with the longest drop being 269 feet. (Of course we are biased as to which country has the most beautiful side of the falls (Argentina, obviously!). But the brazilian side is worth a trip, especially if you want or need to visit another country for your visa or to satisfy your wanderlust. It’s all about the beef. And so much more than normal barbecue. Argentine people will make sure to invite you to numerous Asados during your stay, so make sure to use the chance since not even the restaurants can beat a self-made Asado. You will most likely miss the high-quality meat once you get back home, so enjoy it as long as you can! Learn the real tango in its birthplace! There are several milongas (places where people can dance the tango) in Buenos Aires and even if you don’t dance you can sit back and enjoy the show. In the bigger cities like Córdoba, you can often see people dance on bigger plazas or parques at dawn throughout the year. So you can and either get fascinated just by watching them, or get active by joining right in. Empanadas are dough stuffed with beef, chicken, cheese and ham and either fried or baked. There are a lot of different fillings for everyone’s taste. Argentina is the country of Empanadas, so you can find them literally everywhere! If you get the chance to, don’t miss out on trying some homemade Empanadas, because fresh out of the oven they are simply amazing. The World Heritage Site is in the province of Santa Cruz and home to the Perito Moreno Glacier which is 19 miles in length and three miles wide. It is one of three Patagonian glaciers that is still growing and you can feel it right under your feet if you go take a stroll on top of it. Since Patagonia is a trip in other dimensions you should make sure to plan well and get a bunch of free days to have enough time to admire the extraordinary beauty of this natural wonder. It’s like caramel but made with sweetened milk, commonly found in desserts including alfajores (shortbread cookies). You will get to know them and you will get to love them. Bigger cities like Córdoba have bakeries all over the place with an endless variety of flavors, as well as whole fabrics in smaller towns in the sierras. So you can try different ones and make your own opinion on which one tastes the best (we at NICE internly vote for Havannah). However, if you are not the type for cookies, you can find Dulce de Leche in literally everything, from ice-cream, pastries, to liqueurs and even tea. Famous Rock paintings are part of the UNESCO World Cultural Heritage and can be found in plenty of mountainous regions in Argentina. The most famous though is the rock art in the “Cueva de las manos pintadas” (“Cave of the painted hands”) in the canyon of Río Pinturas in the northwest of Santa Cruz. The history of this colorful place goes way back, so there is not only a lot to see, but a lot to learn about argentine roots as well! Take a peak at the official website here. It’s one of the Seven Summits and the second highest mountain after Mt. Everest. So if you’re in for a Roadtrip to get a break from the citylife, you can catch a bus or rent a car to go visit this beautiful landscape on your free days. Malbec grapes are planted throughout Argentina but mainly in Mendoza, located at the feet of the Andes. So if you have a fine taste, this city is a must-see for you. Even in other argentine cities you can get hold of a bottle of high-quality wine – perfectly to share on the next Asado you are invited to. It’s chorizo (sausage) inside a pan (bread), topped with chimichurri sauce. Simple and delicious, but you can top it with leafy vegetables to spice it up! Similar to a Hot-Dog, but much better. In argentine cities you’ll find many places where Choripan is sold directly on the street, so there is no chance to miss it. If you’re in Córdoba, look for the most delicious food stands near Parque Sarmiento. Not only are the colorful rock formations of Humahuaca itself a famous travel highlight. During the semana santa in march you can experience the beauty of argentine carnaval in the streets of the town as well. Similar to it’s brazilian neighbor it’s loud, colorful and crazy, but at the same time you can find many cultural differences. So make sure to give the northern region of Argentina a visit during these holidays! Known for its seaside beauty, Puerto Madryn is a must-visit-place at the coast of northern Patagonia. The town itself is very pleasant itself, but you’ll get to see the real deal at the bay, where plenty of penguins and walruses breed. From May until September you can even spot whales from the pier. The town does not support boat-based viewing in order not to disturb their beautiful habitat. It’s a mix of parsley, olive oil and other spices and it’s slathered on meat, sandwiches or just eaten with a fresh baguette. You don’t want to miss this sauce on one of the many Asados you’re going to get with your newly-found argentine friends. At the Asado-Workshops from NICE you’ll learn how to make it yourself, so once you return to your country, your friends at home can have a taste of pure Argentina as well. Whilst Bariloche is a Highlight to visit itself – with its world-famous ski resorts and stunning mountain-view, you should continue your journey in the south of Argentina with a tour on the Route of the Seven Lakes. The roads are safe and completely paved and you can make the whole trip in one day – or 3, if you have the time to enjoy it to the fullest. Many of Christian Indian villages were destroyed during the border wars during the 19th century and their ruins have been successively covered by the jungle. The most beautiful and still visitable of the Jesuit missions is “Ignacio Mini”, containing arcade ambulatories, buildings made of basalt, and Indian church paintings. Also worthwhile visiting are the missions of Santa Ana, Loreto, Candelaria and Santa Maria. Tigre is a city not that well-known as most of Argentinas Highlights, but totally worth a visit. Located in the east of the country it offers various activities such as el Parque de la Costa, and a famous market that offers not only art. If you’re feeling luxurious, you can visit one of the many Country Clubs or simply watch the sunrise at Río Paraná, a beautiful river delta outside the city. In the Museo Nacional de Bellas Artes you can find the largest public collection of art in Latin America with more than 12.000 works. If you want to get inspired or admire art of a completely different culture, this is your place to go! Buenos Aires is easy reachable and most likely already on your destination-list, so make sure to stop by at this stunning place! Milanesa is breaded meat and commonly slathered in cheese and topped with tomatos. ‘Nuff said. There are a lot of restaurants that provide Milanesas with different toppings, specialities and side dishes, so don’t miss out on trying them! All of them! The opera house located in Buenos Aires is considered one of the best opera houses in the world with truly amazing acoustics. So you don’t have to be into music to fully get amazed by this tremendous place. It is one of the largest Japanese botanical gardens outside of Japan. So if you are interested in getting even more intercultural during your trip in South America, go and get your ticket once you visit the countries capital city.